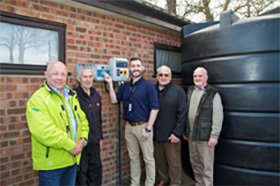 A grant from the Sheringham Shoal Community Fund has enabled the North Walsham New Road Bowls and Snooker Club to install a pop-up automated irrigation system which harvests rainwater to water the Club’s bowling green. 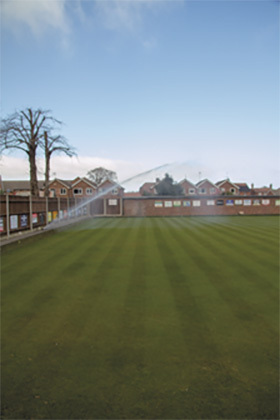 The eco-friendly system features a 10,000 litre rainwater storage tank, the contents of which are used to automatically water the bowling green during the early morning of days when there has been less than 6mm of rainfall in the previous 24 hours. The system was installed by Irrigation Services UK Limited, a Norfolk based company which specialises in design and installation of automated systems to provide sports turf irrigation. Head Green-keeper, 84 year old Dennis Bunn, said he had wanted this system for many years and it is a dream come true.